We all know Miami is a great place to live, and to have a good time. Yes, we’re known primarily for our “good times.” But good times should start off and end, well, “good.” Unfortunately, that’s not always the case. Oftentimes, sadly, some people have too much of a good time and drink excessively and then get behind the wheel of a car and put not only their own life at risk, but the lives of everyone else in their path. This is when “good times” turn into bad times – very bad times – for more than just the drunken driver. Gather as much information from the scene. Include photos, witness statements, contact information, etc. Attempting to collect compensation through insurance companies can be complicated, and you will likely need the assistance of an experienced lawyer. At Friedman, Rodman & Frank, we will help you collect compensation beyond that which is provided through regular insurance claims. We will use our extensive resources to collect, organize and present evidence on your behalf. We help individuals and families across Miami navigate the legal process, while protecting their rights. Our attorneys have the extensive knowledge, experience, and skill you need to determine your full legal options and seek fair compensation for your injuries or loss. 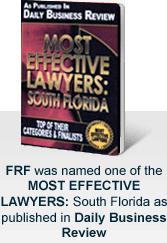 To learn more, contact us online or at our Miami law offices by calling 305-448-8585 or 877-448-8585. We are available 24 hours a day, seven days a week. All consultations are free and confidential.